Do you need to send money to an account holder of BDO? You can process online money sending or money transfer with no enrollment or registration needed from your BDO account to another BDO account. Usually this is done if you want to transfer money for one-time only to an account holder of Banco de Oro. Like paying a hotel reservation down payment, paying for an item you bought from an online seller, someone borrowed money from you and you will send to his BDO account, etc. In these instances, you do not need to enroll the BDO account to your own BDO internet banking access, because you can send money to any BDO account holder easily. Login to your BDO account via BDO Mobile App or via computer/laptop, access online banking login personal. Once you are logged-in, on the left sidebar navigation menu, click SEND MONEY. Options for sending will load which include Send Money for Pickup at any BDO Branch, Send Money Door to Door, Send Money to Another Local Bank, Send Money via Wire Transfer, SEND MONEY TO ANY BDO ACCOUNT, Send Money to a Paycode, and View Transaction Status. Choose the correct one which we highlighted in the choices available. Source Account – if you have multiple BDO account, choose the correct one that will be debited for the sending transaction. Destination Account – You can now enter the 12-digits account number of the one you are sending to, the recipient or beneficiary of your sending money transaction. Make sure that you entered the correct account number. If you only have 10 digits, add “00” before the account number to make it a complete 12-digits. Remarks – You can enter here any message or note that will remind you / recipient about the subject of the transaction. Once that is done, click on Submit. A verification page will load, check that all details are 100% correct. If info is not correct, click Cancel. Otherwise, click on Continue. 6. After clicking continue, a new window appears asking you to enter a One-Time Password or the OTP to authorize the transaction. You can choose to receive the OTP via your mobile app OTP Generator or via OTP via SMS. Once you get the OTP, enter it and then click on Submit. Suggestion: Screenshot the transaction success message or take note of the Transaction Reference Number for your file. You will also receive an email in your BDO-registered email address with the details of the successful money sending to any BDO account. Check this email sample. You can then inform the recipient that you have already sent the money or the payment to his/her BDO account via online. That’s it! It’s really easy to give funds or send money to any BDO account holder without any enrollment or registration. Does the recepient receives the money automatically? Hi Shani, yes, instant transfer ang BDO to BDO account fund transfer via online. The moment successful transfer mo, makikita din agad ng recipient sa account nya yung transferred money. what if im in other country and my mobile is not working here in roaming, how i can proceed with the transaction? Hi Ann, based on our assessment you can’t since Send Money to Any BDO account requires the client to input the one time code that will be received via the registered mobile number. Hi, but i think you can still send or transfer money while abroad just like me. Just have the bdo apps on your phone and no need for otp. Hi. Do I have to register for online banking before I could use it? Or ok lng if hndi? I hope pwdeng hndi na. And is there a maximum amount of money allowed to be sent and kung pwde anytime? Thanks in advance! Hi Dh, you need to enroll your BDO account in online banking first before you can use their internet banking facility. Maximum amount of fund transfer daily is P100K. nasa iligan ako then ng ask ung sender sakin sa bsb number…anu yun? Hi, thanks for your post! If walang BDO account yung sender, she should deposit to the BDO account of the receiver by going to a BDO branch then filling up a deposit slip right? “We are pleased to announce that effective March 15, 2017, BDO Online and Mobile Banking customers will enjoy higher limits for Send Money to Any BDO Account and Send Money to a Paycode transactions. New daily limit will be increased to Php 50,000.00. Does this mean it will no longer be free to make an online transfer to another BDO account? Hi, based on our understanding of the notification from BDO, this is only applicable for transactions “Send Money to Any BDO Account” and “Send Money to a Paycode” transaction. Therefore, our team at iSensey believe that for fund transfer to a BDO account already enrolled in your BDO online banking, there will be no fee. Hi, if ever magsend money thru online, mag aapear po ba sa kabila (receiver) ang accnt number? If yes, may way po ba na hindi madisclose ang accnt number ko? Thanks po. Thank you so much! This is helps a lot. Tawag po kayo sa hotline ng BDO or visit a branch para po matulongan kayo agad. I try to send money for the first time and it appears an info saying that enter correct amount. Please help me on how is the correct process for entering the amont. Thank You. Hi Abby, did you put comma in the amount? If you did, delete it. There should be no special characters in the amount, so don’t use comma. 1.Hi I just try and send money to my moms bdo account is the p10 fee is already applicable? if your mom’s account is not enrolled for fund transfer in your online account, when you transfer to her via “Send Money” facility (as opposed to “Fund transfer” facility), there is a P10 fee per transaction. Hi, i thought 50k ang limit sa transfer to any bdo account. I tried transferring 18k but received a notification that it was beyond the 10k daily limit. If i transferred 10k ng 6pm, can i transfer again by 12:01am? Or ia there a daily time cutoff? Thanks! If the account is NOT ENROLLED for Fund transfer – meaning you will use the “Send Money to any BDO account” option – limit per day is 10K. If the account is already enrolled in your BDO account, and you will use Fund Transfer facility daily limit for fund transfer is 200K. BDO ATM Withdrawal per day limit is 50K. You can transfer again after 12:01 AM, once the date change because that will be a new banking day. Hi. Meron po akong existing BDO Online account where I can monitor and access the details and perform banking transactions. May option ba ang BDO na under my existing online account, magkaroon ako ng mga sub-accounts na pwede ko ding i monitor? Or kelangan ko talaga i-enroll bawat isa para magkaroon din ng online account? You can add all your other bank accounts with BDO (PHP / USD savings, time deposit, current account, UITF, etc.). You can also add joint accounts to your existing BDO online access as long as you are one of the account holders. Just click “Enrollment Services” then choose “Own Account”, you will get a code after the enrollment process. Once done, go to a BDO ATM machine to activate your additional own account enrollment using the code given. Can i send money to any bdo account monthly? Is there a limit of sending money to an unenrolled bdo account? You can send money to any bdo account with P10 processing fee every sending. If you will be sending monthly, we suggest that you enroll the account for fund transfer, so you will enjoy no processing fee and higher amount limit of P200K per fund transfer. Limit per sending is P10K if you are sending to any one with bdo account (unenrolled). I try to send money to an unenrolled bdo account for the payment of items I buy in an online shop but it appears a notice says that it is a unsuccesful transaction. whats wrong? why is this happen? Check if you entered the correct account number, check if the amount you entered does not have a peso sign or a comma. Hi Donabelle, mag e-error po yun during transaction nya. Meaning hindi mag push through ang sending ng money/fund transfer dahil kulang ang account number na nilagay nya. If mag insist yung kausap mo na na-send successfully nya, ask him or her for the transaction number , you can use the transaction number to call BDO toll free hotline to verify. Hi Korin, call ka po sa hotline ng BDO asap para macorrect if ang system nila ang nagka-issue. If mag enroll po ba nang other accounts puidi ko po ba yun eactivate kahit saang atm dito sa kuwait?thank you po. Hi Jhe, the activation needs to be done in a BDO ATM machine if mag eenroll ka ng account na hindi sayo, example: bdo account ng mom mo na you want to transfer funds to kaya i-enroll mo sa bdo online mo. Pag yung ina-add mo na account is under your name too, i-veverify lang yan ng BDO if sayo ba talaga na account then pag validated na sayo, makikita mo na sya sa online access mo. pano po magcancel ng send money transaction via bdo online? thank you. Hi Bea, sa alam namin once successful na ang payment sa send money online di na mababawi yun. Pero we suggest that you try to call the hotline of BDO baka may iba silang paraan. Hi Lani, usually within 3 hours dapat mareceive mo na yung receipt ng online fund transfer/send money mo sa email na nakakabit sa online account mo sa BDO. (double check if you are checking the correct email). Also, check the history bukas kasi mag uupdate na yun at masasama na yung successful send money mo sa transaction log ng source account. nag send ako madalas gamit bdo online transfer to an un enrolled account. pero 2 days ago di nako mkapag trasfer. palaging deatination account invalid. Hi Mark, icheck mo baka kulang ng number of digits, try mo lagyan ng “00” bago ang actual account number. OR baka yung account na dapat mo ma-sendan ng funds is na close na? Pag none of the two scenario, it is best to call the BDO hotline na para maresolve ang concern mo. I tried sending money using the SEND MONEY and fill up all information except the PAYCODE. It won’t go through, it kept on asking for the paycode. San po ba makukuha yung PAYCODE? Paycode is needed if you will use “Send Money To CONTACT” . This option: SEND MONEY TO CONTACT or SEND MONEY via PAYCODE function. You can get the paycode from the intended recipient because he/she alone knows what the Paycode for his/her BDO Account. The Paycode is the mobile number or the email connected to the bank account of the recipient (depends on what he/she have chosen). 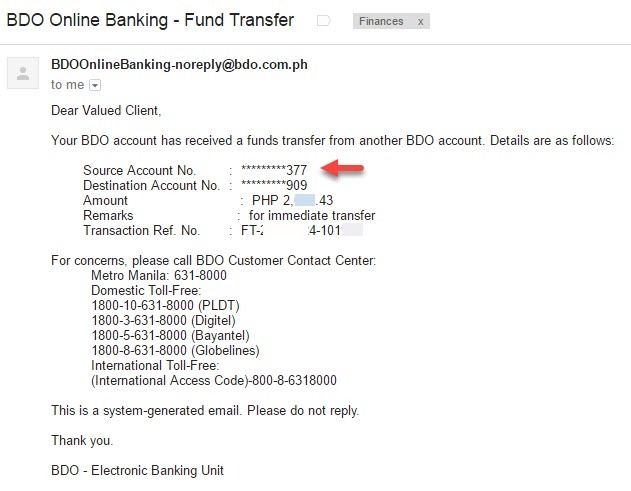 For this to work, the recipient must have previously LINKED her/his mobile number or email to his/her BDO account. We recommend that you use the send money to any bdo account VIA ACCOUNT NUMBER option. pag nag transfer ng money to another local bank account from BDO, how long does it take? almost 24 hours na and di pa rin narereceive yung fund na trinasfer ko but I’m still charge. di ko din Makita yung status online since ung reference number isn’t working. Abo pong nangyare? Thanks. Usually bank to bank transfer is at least 1 banking day based on our experience. Check here for more info on Unionbank to BDO online fund transfer or Unionbank to BPI Account. For specific to your case, we strongly suggest that you contact your BDO branch, they can assist your concern better.